How big is the selection of tuna in Japan? 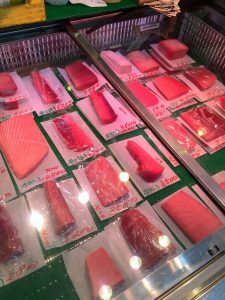 The tuna selection is very large in Japan and there are several reasons for that. There live about 130 million citizens Japan who are fond of tuna of different qualities. It is from the exclusive tuna used in Michelin restaurants for tuna, used in small street eating places. The Japanese are fond of food and particularly tasty food of high quality. Seen with Japanese eyes, tuna is not just tuna. There is a big difference if there is a young or slightly older tuna fish that is being caught. There is a big difference between the quality of the tuna meat depending on where the tuna meat is cut from the fish. Therefore, you will experience different types of tuna when you are in Japan or in a large such as Los Angeles, California. Zoë has held sushi courses and cooking classes for A. P. Moller – Maersk, Hugo Boss Nordic, Novo Nordisk, Novartis, Velux, Gorrissen Federspiel, Beierholm revision, Elbek & Vejrup and many more. Do you know how to make a “clean cut” with your knife? Sign up the newsletter and receive free advice and tips about sushi, Japanese cuisine and Japan. You will also receive Zoë Escher's free 3 tips "How you must eat to boost your health" Your private information will not be shared.